Yesterday, we returned from a week in the Alps. They are known for snow and sking and very few people go there in the spring and summer. So it's very peaceful. It's a very spectacular place with amazing things to see and do. The people are especially friendly. It's an ideal for artists, with amazing views, powerful energies, tall peaks, rivers and grazing land full of goats and cattle. The architecture is very fine too. I would have liked to spend more time drawing and painting. It would be worth it. Next time. Here are some drawings from the trip. Some rocks in the river which runs through Allemonte. A view from the river to the opposite bank. 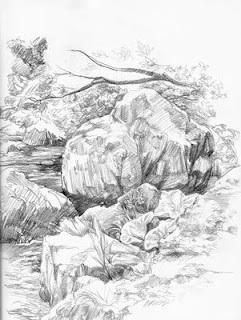 A study of water around a rock. A sketch of my wife. A study of some flower petals. NICE work Tom!!! It's nice o see how your way of drawing is present in all of your drawings!! Most have been beautiful in the Alpes! A hug, Helen. American Executive based in Ireland ? Life Drawing, model vivant, 24th August 2011.